Gov. 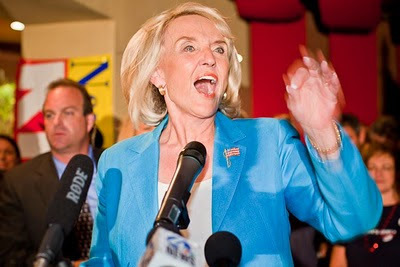 Jan Brewer thanks her supporters at an election night victory party in Tucson. Jan Brewer, Arizona’s “Accidental Governor” appears to be on her way to a full four year term after winning a landslide victory in Tuesday’s Republican primary. Brewer is sometimes called the “accidental governor” because she was Arizona’s Secretary of State and she inherited the governor’s office when incumbent Democratic Governor Janet Napolitano was tapped by the Obama administration to be the Secretary of Homeland Security. In January of this year most pundits had already written off Brewer’s chances of re-election. The state’s economy, largely dependent on the housing industry, has been in the tank since before the beginning of the current Great Recession. While some parts of the country have seen modest economic improvement, Arizona continues to wallow in the depths of the downturn. Brewer promoted a special election for a one cent increase in the state sales tax, an anathema to the other taxophobic Republicans in the state legislature. Many of them favor slashing state budgets for education, health care and social services rather than raising taxes. But she got the sales tax passed with the help of teachers and the force of her personality. She hasn’t looked back since. Her poll numbers improved all spring and summer and one by one her Republican opponents dropped out. She cruised to an easy victory. Now she looks to be on track to defeat Terry Goddard, the state’s incumbent Democratic Attorney General. In other primary news, John McCain handily defeated JD Hayworth, and former Vice President Dan Quayle’s son, Ben Quayle, appears to have won the Republican primary in Arizona Congressional District 3. Quayle is a political neophyte best known for using the pen name “Brock Landers” when he contributed entries to an adult themed web site called dirtyscottsdale.com (now called just thedirty.com). There are more photos of Brewer’s Tucson victory party in my archive.